Their country was founded as a homeland where they could finally be safe. Their religion would not be an issue. Their mosques would be be secure, and their children would not face discrimination. Here, their community members flourished. They were in government, they were successful doctors and scientists. Alhamdulillah, life was good. Then something happened. A dark fog began to gather in the words they were hearing in the streets, and they began to worry that even here they would not be safe. They tried to protect their children, shooing them out of the room when the TV anchors were talking about politics. There was talk about banning their religion, demolishing their mosques, turning them into second class citizens in their own country. They told themselves it couldn’t happen here. The father of the nation had declared this nation would be a homeland for them, too. But it did happen. The political movement was too strong, their neighbors were too apathetic, or did they secretly hate them too? The constitution was amended, and their religion was blacklisted. They found themselves attacked with impunity. Their mosques were demolished. They were forced to endure every type of humiliation. They were mocked and ridiculed and their faith was spit on. 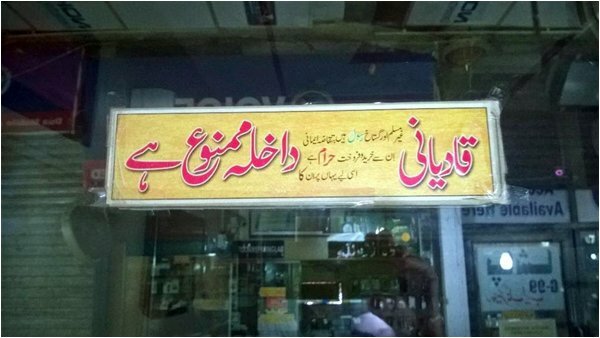 This entry was posted in Blogs and tagged ahmadis, religion, trump by Sidra Jafri. Bookmark the permalink.